Tránsito has just been driven inside the Meineke shop where it will be determined what happened to his air-conditioner. Also, why the front left turn lamp does not work. The collision dented the air-conditioner's condenser. 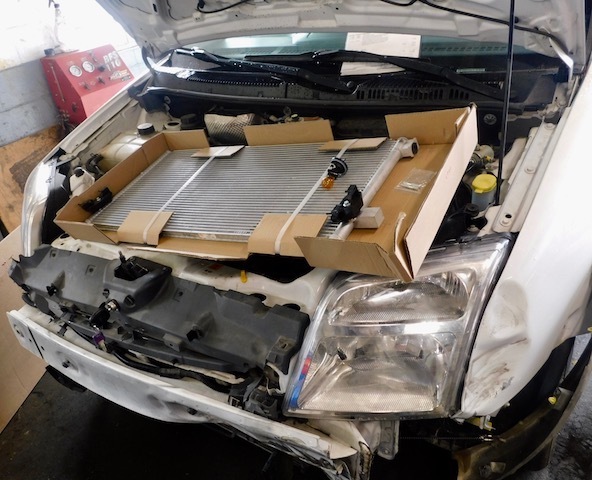 The condenser sits in front and is very vulnerable in the event of a collision. The parts for our A/C repair have been ordered and the entire job is promised to be finished today. The cable for the front left turn lamp was pulled off at the time of the accident. As a result, the plastic base of that lamp is slightly cracked. It seems that the turn lamp is not available right away. So, the mechanic suggested that he could fix the broken lamp by tightly winding electrical tape around the lamp's base which would close the crack enough for the turn signal to work again. Tránsito at the Meineke shop. Jesse, Meineke's manager, brought me into the shop to show me the replacement condenser which was just delivered. The condenser is large! Much larger than I had imagined it to be. Maybe that is the reason that Tránsito's air-conditioner cools so well. New A/C condenser. Do you see the turn lamp in the box? There is a purge operation at the end of an air-conditioner repair that reports whether the A/C system is leak-free or has a leak. My system test reports a leak. This may mean that the Scampy Team is going to Nite Camp here at Meineke for a second nite! Although the test reported a leak, when the air-conditioner was turned on and completely warmed and under load, no leak showed itself. So, we are heading out and are on our way! 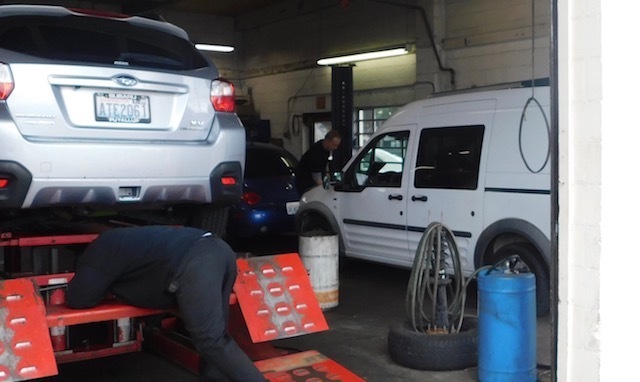 If a leak does show itself, any Meineke shop will fix it. Meineke covers repairs for 1-year or 12,000 miles. I just looked at my calendar. My Son David died on this day in 2010. Eight years it has been! For a long time after David had passed away, I felt that I would never get over that tragedy. David's death by suicide impacted me sooooo much! At times I was angry. Then deeply depressed. David was on my mind every day! However, the time came when I realized that I had not thought about David for an entire day. The passage of time had, in a small way, healed me. I feel a little odd saying this but it's because Senior Transito has been in an accident that things are not working. Glad they are working on Transito to get it back in shape. I also feel odd agreeing with you that the accident is Señor Tránsito's fault. Poor Transito couldn’t leap out of the way George! He sacrificed himself for you and his brother Scampy. After all, he was carrying you and his brother on his back! Way to go Transito! All will be well. We have been teasing Señor Tránsito about leaping out of the way from that Chevy Colorado truck. However, the real cause of that collision accident is that the Colorado's driver crossed over the median lane! Is the insurance company not declaring it totaled ? If the insurance company is involved, anyone running a Carfax on your vehicle it will show up as an accident repaired.when it comes time to sell your vehicle you'll take A hit on the price because of it. It's OK to turn it off while they're working on it. Don't let them talk you into removing it permanently . The insurance has not yet seen Tránsito. 1. Are you suggesting that I pay for the collision repairs myself and not get reimbursement from the insurance company? 2. Do you understand that I reported the accident to the insurance company right after the accident? 3. How will I know if the insurance company declares Tránsito totaled if they are not involved? "So if you get it repaired you'll come out better for yourself because you don't have to do any re-work ( New existing storage )on a new vehicle "
a. What does "do any re-work" "mean? b. What does "New existing storage on a new vehicle" mean? b. Why should I be involved with the body shop regarding the "airbag deployment bracket"? Ed, if you read George's previous blog, he said he was going to call the insurance company before getting this particular needed work done and get their approval for payment. They would not have approved the work if they intended to only pay him the totaled value of Transito. George also has photos of the damage to Transito, so the insurance company has or will ask him for those photos. PS don't worry about the bracket or the airbag deployment mechanismif it didn't go off this time,, it probably won't do it the next time. The body shop that he went to could give him an estimate, the estimate doesn't always mean what the insurance company is going to pay . the ultimate decision is with claims adjuster... Not the guy or gal in the office guesstimating so without the insurance adjuster looking at the vehicle George still has no idea what his insurance is going to pay for, less deductible. Tránsito will not be available for the insurance adjuster to see until I arrive in the Beaverton Oregon area. Until that arrival, I will be on-the-road. The insurance company is involved. The insurance company is paying for the collision damage. I am not at all concerned about taking a hit on the price when Tránsito is sold. It will be very easy for me to outfit the new truck with storage cabinets including drawers. You wrote that I like to build things. You are sooooo right about that! But it is really that I LOVE 😍 to build things! Ed, I believe that you and I are now in tune together on this subject. Whatta you think? Hi George.. I am also 80. My son is also named David. Please know your son is remembered by myself very often as I read your blog or speak with my son. My son is also a bachelor as your son, and both worked with computers, and both owned their own homes. These and other similarities are eerie. I cannot imagine not being able to talk with my son, as we talk many times each week. Even though we live in Michigan we have traveled to California while our kids were young, and since often my wife and I by ourselves in our Class A coach. We have visited the redwoods many times. So please know your son is not forgotten. His good deeds trying to raise foster kids is not forgotten. Your words at the time of his passing are not forgotten. As I have written before, you are one of my heroes, and the greatest RV blogger of all time. Looking forward to your many more years of travel, rving, and blogging. "So please know your son is not forgotten. His good deeds trying to raise foster kids is not forgotten. The first time that my family [Myself, wife Evie, sons David and Joseph] went rafting was on the Klamath River with Bill McGinnis' Whitewater Voyages. That was in 1977. Shortly after, I bought my own raft. Then I bought kayaks for son David and myself. We attended Sierra Club classes in Silicon Valley to teach ourselves how to roll-up a kayak. I believe our first time river running the Whitewater Section of the Rouge River was in 1979. The Rogue became are favorite river. We did the Rogue perhaps 30x between 1979 and the early 1990s. You may have not picked from reading my Blog what got me back to RVing again. It was nothing less than a miracle!! 1. Stop taking all prescription medication 5-days before the procedure. 2. On the day after the procedure, double all prescriptions and then continue medication as before. But something really fantastic happened! After 5-days off all my meds, I felt sooooo healthy! My right hand and right foot were not twitching! Also, I felt stronger too! The next day I doubled all meds as instructed. By that afternoon, my right hand and foot began twitching again. I felt miserable. I never went back taking ANY prescription meds after that!! "If you do not take blood thinner meds [Coumadin], you likely will have blood clots which may lead to a stroke and paralysis." But I had my proof of what those damned meds had done to my health. What did I need? A rock to drop on my head?! All of this happened around mid-June, 2016. After that, I stopped doing annual medical checkups. Now I never return to Kaiser except for flu shots and an annual dermatologist check-up. And get this! My weight which had always been 185 to 195 lbs, dropped to 160 lbs!!! That's because I now eat sooooo much less than before! I believe that those meds played havoc with my feelings of hunger. I used to take blood pressure meds and a whole lot of other blood meds. Now, without those meds I have normal blood pressure. Normal cholesterol. "It was nothing less than a miracle!! Seriously. George is the bomb! Is being a bomb a good thing? Definitely! The best good thing!